Final Notes on the EMPeaceLABS 2012 - Ronald L. Mann, Ph.D. Final Notes on the EMPeaceLABS 2012 - Ronald L. Mann, Ph.D. 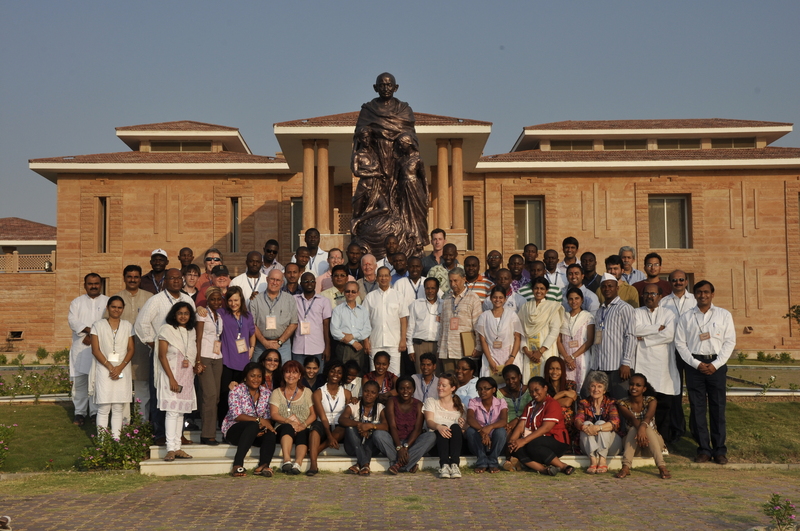 I have returned from the international conference in India and want to bring you up to date. This was a very valuable and productive experience that brought people together from India, Africa and the United States. The main organizers from the Arizona State University were Dr. Marek Wosinski and Dr. Rimhjhim Aggarwal. The Arizona staff did a fabulous job in making this conference a reality and were open and flexible during the week to create a very dynamic, interactive event that created a lot of inspiration and vision for the future. 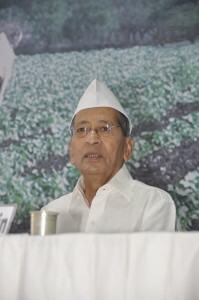 Dr. Rimhjim Aggarwal at opening ceremony. Dr. Marek at opening ceremony. We were hosted by the Jain Irrigation System, Inc. and were provided wonderful accommodations and gourmet vegetarian food at the Jain Learning Center. 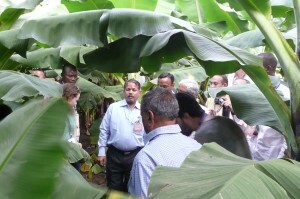 Jain provides training programs for thousands of individuals each year in irrigation and agribusiness. They have a large staff and really took care of us. No one got sick from the food or water and the accommodations were very clean. The staff was attentive and selfless. 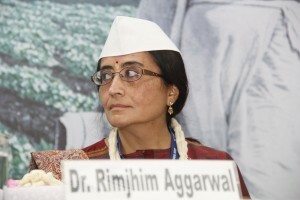 They have a few thousand acres, which includes the Gandhi Research Institute. Dr. Jain also built a boarding school on the property that consists of 1,000 acres. We had many opportunities to spend time with these students and found them to be very bright, friendly and extremely well mannered. India is education and training future world leaders. The program was organized into three main components: Gandhi Philosophy, Jain Irrigation Systems, and Leadership Development. The purpose was to integrate various approaches and areas that have typically been separate: empower of women in leadership, agribusiness, food production, water conservation, non-violent approaches to peace, and leadership development. All these facets were discussed and integrated into a global approach for developing countries like India and Africa. There is a comprehensive website at http://ucpsarnet.iglooprojects.org/blogs/public/empeacelabs2012injalgaon and you can join the university partnership there. The blogs details the purpose and beginning meetings so well, I am just quoting it here. There is also another post at http://ucpsarnet.iglooprojects.org/blogs/public/twodaysatempeacelabs2012articlebyfrankkrishner that is excellent and I encourage you to read it. “The past century has been the bloodiest in history, and the morning news bulletins in the first decade of the twenty first century haven’t given us much hope of things getting better: conflict appears to be spreading across every corner of the known world. The developing countries across the globe are facing the forces of fragmentation and frustration on an unprecedented scale. In India, in Africa, and elsewhere in South Asia serious conflicts have arisen around issues of land, water, and food security. Every disaster, whether man-made or natural, sets back development indicators several notches, and the resultant poverty further fans frustration and more conflict. It’s a vicious cycle. The United Nations, at the turn of the century had propounded the Millennium Development Goals, a comprehensive strategy for poverty alleviation. However, these goals cannot be attained in an environment of hostility and mistrust. But how does one break this vicious cycle of poverty, frustration, and fragmentation? Perhaps an answer can be found in the philosophy of the greatest advocate of peace in modern times: Mohandas Karamchand Gandhi, known in India as the Mahatma. For Gandhi, the key to lasting and sustainable development was to be found in the uplift of the village communities, through enabling each village community to develop and manage their resources. In Africa, as in the Indian subcontinent, it is food security that is of major concern, and the issue can be addressed through the empowerment of the farming communities. Empowerment of farming communities for peace is at the heart of the EmPeace LABS concept. ‘Empowerment for Peace through Leadership in Agribusiness and Sustainability’- that’s the idea and the objective is the eradication of poverty in rural communities. EmPeace LABS 2012, that kicked off on Saturday morning drew participants from Cameroon, Ghana, Gambia, India, Nepal, Nigeria, Kenya, Liberia, Mozambique, Swaziland, Uganda, and Zimbabwe as well as panelists and experts from JISL (Jain Irrigation Systems Ltd), ASU (Arizona State University), and GRF (Gandhi Research Foundation). It’s an international leadership-training workshop that aims to develop the participants’ leadership and entrepreneurial skills, to build sustainable practices in agribusiness and water management through working sessions and ‘hands-on experiences’. This will create peaceful, prosperous communities. EmPeace LABS aims to connect various community youth leaders, especially women, with corporations within their communities and with their local governments to co-design and implement sustainable projects, through a ‘multi-stakeholder approach.’ As Michael Crow, President of Arizona State University puts it, “We believe that through research and freely shared knowledge, we can create a socially, economically, and ecologically responsive society – a global community that understands the consequences of our actions and acts accordingly. Community led innovation can help solve food security challenges at the local and global scale. When farmers and local leaders engage in agricultural development and agri-business, communities prosper. This prosperity and stability dramatically improves long term prospects for global peace by reducing the strain on food systems, especially for the rural poor. The speakers at the inaugural session emphasized the Gandhian values of ‘truthful engagement’ in the developmental process. 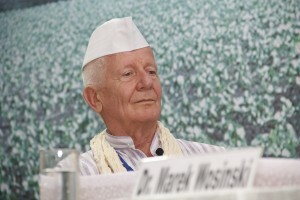 Dr Marek Wosinski of UCP- SARnet, who was one of the initiators of a unique community based College of Social Work project in West Champaran, India at the site of Gandhi’s first ‘struggle for truth’ and development in rural India, said that the need of the hour was to liberate Gandhi from the textbooks and the museums and bring Gandhi into practice in the villages of Bihar. 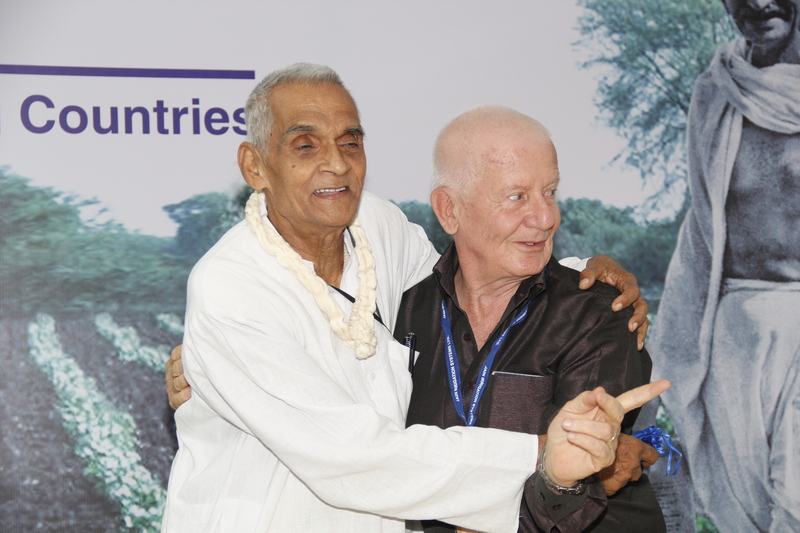 Dr Bhavarlal Jain, founder Chairman of Jain Irrigation Systems, spoke of the incorporation of values in business that would serve to empower and sustain all living creatures, and of his own group’s continuing efforts to put Gandhian principles into sustainable practice. There is a lot of information about this conference on the UCPSARnet website, so let me give a more personal account of my experience. I found the Gandhi influence very inspiring as it was integrated into everyday life. 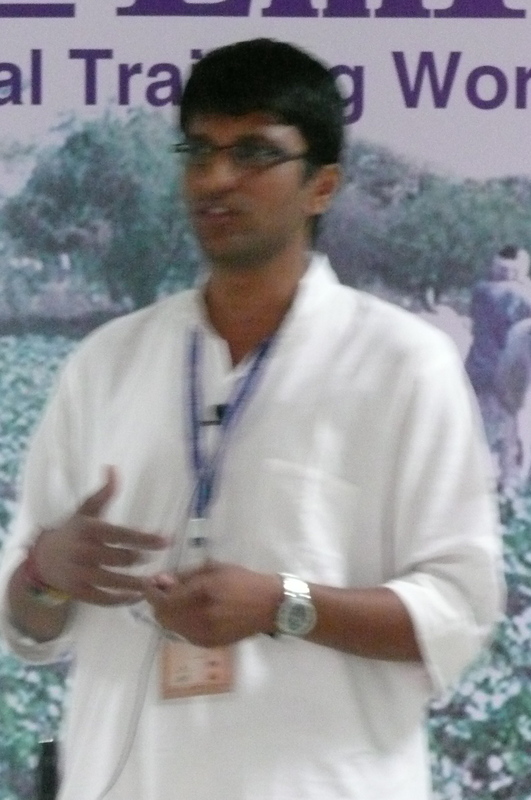 All speakers from the Gandhi Research Institute talked about sustainability in a way that made a lot of sense. Sustainability was about creating programs, businesses and relationships that would last over time because all stakeholders were valued and respected. Relationships were grounded in honesty and people were not viewed as things to be used and resources to be consumed. The earth was regarded with respect and our human relationship with the earth was discussed as we learn to manage our limited resources for some kind of intelligent design. The participants were very bright, dedicated and interested. I made a great relationship with Adeyemi Damilare, a young man from Nigeria. He is very interested in connecting Coaching the Global Village with the African Union Youth Council. We spent a lot of time meditating together and designing plans to roll out coaching for leadership development of African Youth. 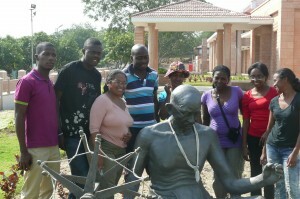 He was also very interested in the BrightHeart program for children that has been initiated in Uganda. There was a lot of interest in leadership training from a variety of countries. 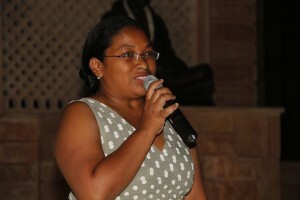 The team from Madagascar consisted of a very dynamic woman Zo who translated everything for her three woman team. Zo was one of the most active participants and had tremendous leadership skills. She is very interested in continued training for young leaders in Madagascar. Rohiit Jain is another fine young man I met. He is from northern India and has a Master’s degree in Communication. Rather than move to the city for some kind of IT job, he has chosen to remain in his local village and create a collective farm that is successful in producing and marketing food in his area. He is creating a sustainable agricultural business helping his local community and finds great personal value in doing so. I am interested in exploring the development of a micro loan group to help him with his program. He has a successful track record, a great set of values, and is a smart guy who is worthy of trust and support. One of the most personally inspiring connections I made was with Professor Ramji Singh from the Gandhi Research Foundation. As a boy, he knew Mahatma Gandhi. Professor Singh has a remarkable aura of peace around him. For a man of eighty nine, he was in great shape. 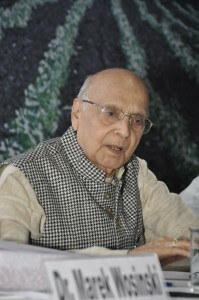 He gave a fiery talk on the life, history and teachings of Gandhi. He wanted me to go by Ram as a spiritual name in India. He was such a brilliant intellect and a profound yogi that Dr. Marek Wosinski was moved to ask him how he could integrate both a great mind and a personal level of development that was so pronounced. Professor Singh simply responded that during his entire life he constantly strived to reduce himself to “zero.” He response had a strong impact on me and the entire group. He was a living model of spiritual realization and the power that results when the ego no longer is the primary principal running the show. 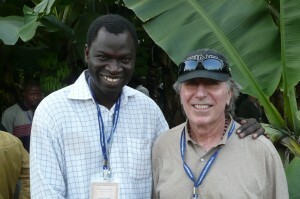 I was blessed to meet and befriend another unique individual, Pape Samb. We had great fun shopping together in the local town and discussing leadership and world change. Mr. Samb is the Director for Programs for Africa at Phelps Stokes. He has a warm, open, joyful and inviting presence. He spoke to the entire group and especially emphasized the importance of bringing people together and being a “relationship broker.” He also emphasized the notion of sustainability by working for the benefit of others and working with others. He was very uplifting a emphasized the important of acknowledging others. He had a very interesting approach to enhancing one’s capacity to help others: suspend assumptions and change questions. He advised us to always be a learner in order to create better relationships, as we must understand other people’s values if we are to successfully work with them. Finally, he discussed the Global Youth International Conference that addresses core values for youth: Trust, Accountability, Reliability, Growth, Empowerment and Truth. These are core values that will help anyone. Mr. Samb is one of the special people out there. If you every have a chance to meet him, your life will be enhanced. One a personal note I was especially moved to be with him because he is a Muslim. With all the bad press that Muslims get in today’s world, it was a blessing to be with such a wonderful man with great values. One day we had a full field trip to several farms. We saw cotton, onions, papaya, and banana farms. The Jain Irrigation staff have food production down to a science. They can calculate the number of fruits a plant will produce and how much water it needs to do so. Through the drip irrigation systems they have vastly reduced the amount of water necessary for production and greatly enhanced output. They have a vision for water sustainability to see the conservation of water as a major concern for our future. They are interested and available to take their technology which includes solar energy into Africa. There were many very precise presentations made about their work and projects, which ranged from irrigation, food production, farm management, solar energy, water desalination and pipe production. In summary, the leadership development aspect of this project was well integrated due to the strong commitment and influence of the Gandhi Research Foundation. All of Gandhi’s philosophy was compatible with our coaching approach that is founded upon relationship building and self-empowerment. This conference stressed the importance of individual creativity, responsibility, and initiative. The participants were education and informed about the latest technologies for food production and given basic tools and inspiration for leadership development and personal empowerment. Relationships were established that will continue across Africa. Coaching the Global Village was an important component for future training and support for all participants. There were cross cultural presentations every evening from each country. 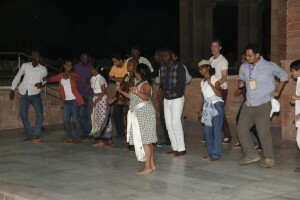 Dancing was the common language that brought joy and bonding among the participants and the children from the local school. This is really awesome, you are a blessing to me. I can’t afford to lose you as my mentor.